The underground secant pile wall is 95 percent complete and is targeted for completion in March of 2018. The secant pile wall is being constructed 730 feet downhill of the emergency spillway at depths of 35 to 65 feet. Foundation preparation continues for the roller-compacted concrete (RCC) splashpad. Crews are expected to begin placing RCC next week. The RCC splashpad, in conjunction with the secant pile wall, will armor the existing terrain to significantly reduce the type of uphill erosion that occurred during February 2017 if the emergency spillway is ever used again. Work at the emergency spillway also include construction of an RCC buttress at the base of the emergency spillway, which will begin later in 2018. Removal of the original 730 feet of the upper chute leading to the radial gates and replacement with steel-reinforced structural concrete. Placement of a 2.5-foot layer of steel-reinforced structural concrete over the RCC middle chute. Removal of the RCC walls in the middle chute and replacement with structural concrete walls. Hydro-blasting and resurfacing of the energy dissipaters at the base of the main spillway. 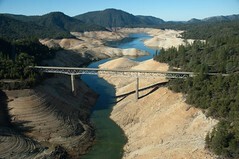 DWR will meet with the Independent Board of Consultants (BOC) for the 15th time tomorrow and Friday, Feb. 22 and 23. The BOC is also reviewing the Independent Forensic Team’s final report released last month. The crew pours concrete for the top section of the cut-off-wall that will connect to the splashpad. A section of ground near the lower spillway is removed for a new road. Work continues between the emergency spillway weir and cut-off-wall, prepping the ground for the splashpad.